Mull is a large, unspoilt island with a coastline of over 300 miles, yet its population is only about 2,800 (2011 figures). Much-visited for its scenery (hills, waterfalls, sea caves, forest walks and beaches), it is also very popular for fishing and is home to 2 golf courses (at Tobermory and Craignure). The southern and western parts of the island are where you will find the mountains. The highest of them all at 3169 feet is Ben More whose scree slopes are the remnants of a volcano which exploded 60 million years ago. Many tours of the island and its neighbours (Iona, Staffa and the Treshnish Isles) are available. Tour information is provided at the end of this webpage after the sightseeing section. Those of you with young children will know of the BBC TV series called Balamory - much of which was filmed in Tobermory. The official Caledonian Macbrayne website lists the current timetables in detail. Tel: 08705 650000. The summer timetable operates from end March - mid October. The ferries in winter are generally less frequent. The ferry between Oban (90 miles north of Glasgow) and Craignure goes up to 10 times daily during the summer (8 times on Sundays) and is usually very busy. The journey takes about 40 minutes. Vehicle reservation required. Lochaline is 72 miles from Oban. Fishnish is 6 miles north of Craignure. The ferry runs frequently back and forwards, and takes 15 minutes. It is only a small ferry, so you can't make a reservation for your vehicle - you just queue up and wait for your turn. Prices & timetables. The journey takes 35 minutes. It is only a small ferry, so you can't make a reservation for your vehicle - you just queue up and wait for your turn. Prices & timetables. Kilchoan is 84 miles from Oban by road. You'll need to take your time driving on the narrow, twisting roads. It may only be 20 miles from Craignure to Tobermory, but it can take a good 45 minutes by car. And if you're driving from Craignure to catch the ferry over to Iona, you'll need about an hour. These operate in conjunction with the ferry arrivals/departures. You can buy day tickets which enable you to hop on and off as many times as you like. Telephone West Coast Motors 01586 552319 / 01680 812 313. 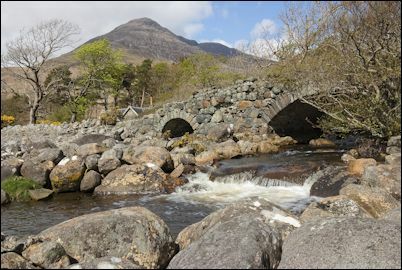 Tour information - including day trips from Oban, wildlife excursions, self drive tours, and hiking trips - click here. Mull & Iona Taxi. Transport by 8-seater minibus. Airport collections. Private tours available. Member of the Argyll Islands Tourist Guides Association. Contact David Greenhalgh. Tel: 01681 700 507 / Mobile: 0788 777 4550. Brown's shop, Main Street, Tobermory. Tel: 01688 302020. On Yer Bike at Inverinate, Salen near Aros (not far from Tobermory). Contact Babs Whyte. Telephone 01680 300501. Open Easter - October only. Mull Cycle Hire in Tobermory is on Eas Brae (just a short walk up the hill from the main street). Electric bikes and mountain bikes available. Booking required. Tel: 01688 302923 / Mobile: 07880362007. 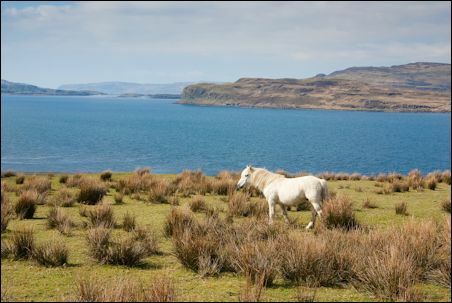 Mull Pony Trekking is situated at the head of Loch na Keal 2 miles west of Salen on the Killiechronan estate. Contact Liz - tel: 07748807447. Isle of Mull Cycling Club - web site with details of bike routes. The Mull & Iona Ranger Service holds a variety of events from April to October. Tel:: 01680 300640. 17 - 19 May: Scottish Island Peaks Race - starts in Oban, then Mull (Ben More), Jura (the Paps), Arran (Goat Fell), then Troon. Visit the events diary on the Round About Mull web site to find out what's on. My travellers' tips file may also be useful if you are planning a trip to Scotland. It covers airlines, national car hire, train information, maps, etc. Mull has lots of opportunities for wildlife spotting from birds to marine mammals and over 4000 plant species. Guided walks with local Wildlife Rangers operate throughout the year. Explore the forests of Mull courtesy of the Foresty Commission free leaflet. Watch a pair of nesting sea eagles with a wildlife ranger as your guide. From April to October 2018, this is hosted by Craignure Golf Club. 90-minute trips will run at 11am and 2pm (not Saturdays). The exact meeting point near Craignure will be given when you book. Booking is essential - contact the Visit Scotland tourist information centre at Craignure - tel: 01680 812556. There's also ranger-led trips to the White Tailed Eagle hide at West Ardhu (north-west Mull) from Mondays to Fridays at 11am and 2pm. Booking is essential - contact the Visit Scotland tourist information centre at Craignure - tel: 01680 812556. Follow the sea eagle blog or follow them on Facebook. Sea eagles and golden eagles can also be seen in other parts of Mull (especially around Loch na Keal, Glen More and Loch Scridain). Boat trips to see whales and dolphins are available from various places on Mull - please see links below. With its shops and restaurants, Tobermory is the capital of Mull and is well known for the brightly painted buildings of its seafront. There is a Youth Hostel here in the main street, together with a bank, post office, butcher, chemist, hairdresser, launderette, supermarket and garage. Shops include a chandlery, clothes shop, art gallery, book shop, Mull Pottery, and Isle of Mull Silvers & Goldsmiths. Browns is an Aladdin's cave and features fishing gear, whisky, gifts and many useful items to be found in the ironmongery section. Island Bakery Organics has a delicatessen and lots of quality foodstuffs. See the bottom of this page for restaurants and places to eat. In the summer, daily trips for sea fishing or wildlife viewing are available from Tobermory - to book, go into Tackle and Books in the main street (telephone 01688 302336). They have some resources online about where to fish when you are visiting Mull. The harbour is often full of boats and yachts. It's also popular with divers too, possibly searching for gold bullion from the Spanish galleon Florida which took refuge in Tobermory bay in 1588 and was blown up by the local clan. Check out Tobermory Chocolate on Main Street which includes a shop with handmade chocs and cafe. Another good place for a treat is the Isle of Mull Ice Cream shop. 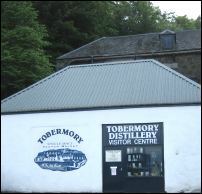 The Tobermory Distillery at the far end has a visitor centre and offers guided tours (tel: 01688 302645). Along from the distillery, and the nearby pub/restaurant, you will find Explore Mull which provides alsorts of visitor information and booking services in their new exhibition trailer. Tel: 07812 543190. Taigh Solais is the newly built visitor centre by the marina. The centre includes toilets, showers and laundry facilities for visitors, as well as the Mull Aquarium with touch pools, gift shop, etc. Tel: 01688 302876. The building is also home to the Sea Life Surveys which operatess boat trips to see whales, dolphins, sharks, porpoise, seals and seabirds. Tel: 01688 302916. At number 28 on the Main Street, you can visit the Hebridean Whale and Dolphin Trust which has a multimedia exhibition and gift shop. Open during the summer Monday-Friday 10am-5pm and weekends from 11am-5pm. 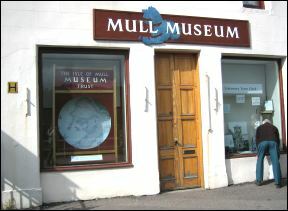 The Mull museum on Main Street is open Easter - October, Monday - Saturday (10am - 4pm). Operated solely by volunteers. Donations welcome. The web site for the Mull Historical & Archaeological Society is also interesting if you are interested in the island's heritage. In 1997, the old Victorian Gothic primary school opened as the home of An Tobar Arts Centre with exhibition, cafe, plus performance and youth projects spaces. This can be found up the steep hill on Argyll Terrace (Tel: 01688 302 211 / Fax: 01688 302 218). The cafe and shop are open Tuesday - Saturday, 10am - 4pm. The Mull Little Theatre has new premises at Druimfin, just outside Tobermory. The company also has many touring shows (01688 302828). From Tobermory, you can walk to the nearby Rubha nan Gall lighthouse at Strangers' Point. Go down to the pier and take the wooded path along the hillside. It can be narrow and muddy in places, so not everybody might want to go - especially if you don't like heights. You can retrace your steps to Tobermory, or this can be turned into a circular walk with a bit of a scramble up the hill to the golf course. Another walk from Tobermory starts at the other end of town near the distillery. The footpath runs along the hillside heading northwards. On the way you will see foxgloves and rhododendrons. Make a detour to the two waterfalls and look over to the Ardnamurchan Peninsula. The path will lead you to Lochan a Ghurrabain where there are toilets and a lake. Aros Park is also accessible more directly by road. 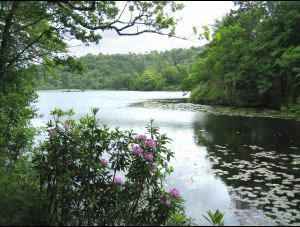 The local Forest Enterprise also hosts guided walks and activities throughout the summer season all over the island. Just outside Tobermory village, you'll find the Gallery and Caf�/Bistro of Mull Pottery (which has WiFi access) and also Martin Guppy's shop - full of his postcards, calendars and photos. Robert Pollock describes the standing stones south of Tobermory. You can also go walking in the forest to the north of Tobermory near Glengorm Castle which offers self-catering and B&B accommodation. You can visit the castle's coffee shop, farm shop & art gallery (daily from Easter to October). The Glengorm Wildlife Steward can offer guided walks from 2 - 6 hours. Contact tel: 01688 302 321. Wildlife lectures, children's activities and workshops also available. There is a track from here leading to some standing stones and the ruins of Dun Ara Fort. 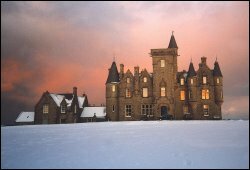 Glengorm Castle was built in 1860 for James Forsyth, the laird of the Dervaig Clearances which forced hundreds of people out of their homes. It is said that the laird asked a local woman what she thought would be a good name for the castle. She suggested Glengorm and he agreed. Little did the laird realise that this was Gaelic for Blue Glen - a reference to the blue smoke that filled the air when so many of the houses were destroyed on his orders. It now offers B&B and self catering accommodation. Village resting in the bottom of the valley near Loch a'Chumhainn. The Dervaig Producers' Market is frequently held in the summer on alternate Sunday afternoons in the village hall - local produce & crafts, tea, coffee & cakes. Contact Cath on 01688 400474. 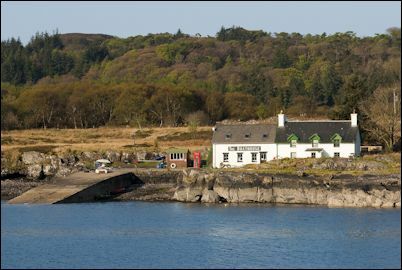 Dervaig is home to The Bellachroy - the oldest inn on Mull. Renowned for good food (including many local seafood specialities), this 6-bedroom hotel has a friendly pub with regular entertainment. Tel: 01688 400314. Near Dervaig is the award-winning Old Byre Heritage Centre which recreates life on Mull during the 19th century. Tea room and gift shop. Tel: 01688 400229. From Croig near Dervaig, you can take a full day cruise or whale watching trip (8 hours approx.). Contact Inter-Island Cruises (Tel/Fax: 01688 400264). Before you reach Dervaig along the road from Tobermory, if you have a good map of the area, you might like to explore some of the nearby standing stones. You will see a couple marked on the map to the left of this road, then closer to the village are the Kilmore standing stones located just inside the forest on the right. From there you can go deeper into the forest and after around half a mile you will see another clearing containing yet more stones by Maol Mor. Robert Pollock has produced an excellent guide with diagrams covering some of these stones. A popular sandy beach with toilets. You might spot buzzards here. The Calgary Beach Sailing Club offers dinghy hire and tuition from May to October (tel: 0777 6130224 / 01688 400 465). The Internet Guide to Scotland and its licensors. All rights reserved. Not to be downloaded or reproduced. At the Carthouse Gallery & Tearoom you can see lots of local artwork. Light lunches and home baking available. Tel: 01688 400 256. Calgary Art In Nature includes pieces of sculpture within the woods at Calgary. Robert Pollock describes the nearby Cillchriosd standing stone. If you are driving around the island, continue on southwards from Calgary and take a walk to Treshnish Point which has great views of the Treshnish Isles. Treshnish Farm offers a variety of eco-friendly self catering accommodation including cottages, a studio and blackhouses. Visit their web site for photos of this dramatic coastline. Take a look at their nature blog and farm blog. There's supposed to be a cave near here which was once used as an illicit still. Continue on the B8073, past the Eas Fors waterfall and you will reach Ulva Ferry. A small boat takes passengers over the Isle of Ulva ('wolf island' in Norse) where the grandfather of the explorer David Livingstone was a crofter. On the south shore is the burial ground of the Macquaries who owned the island for 800 years. Once, 500 people lived here, but the Highland Clearances put paid to that. The Boathouse offers home baking and meals with local seafood (open April - September). Nature trails have been set up on the island. After 3 generations of the Howard family owning the island, in 2018 the North West Mull Community Woodland Company (NWMCWC) was able to buy Ulva in a publicly funded community buyout. 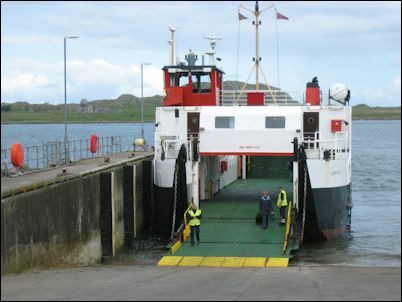 Passenger ferry only for the short crossing from Ulva Ferry (operates on demand) - contact Donald Munro (tel: 01688 500226). April to October (Monday - Friday) and Sundays in June and August. No Saturday service. Ulva Ferry Community Transport operates a local bus service. You can also take the bridge from Ulva to its neighbouring island of Gometra. Gometra is one of the small islands off the coast of Mull in the Staffa Archipelago. Along the western coast of Mull, you are quite likely to see seals on the rocks if you look carefully for them. Turus Mara boat trips operate from Ulva Ferry (opposite the island of Ulva). They offer day trips to Staffa, Treshnish Isles and Iona. Telephone 01688 400 242 or freephone 08000 85 87 86. A courtesy bus available from Tobermory. A full package of coach/ferry/cruise is available from Oban - contact the Caledonian Macbrayne Tourshop in the Ferry Terminal Building, Railway Pier, Oban (tel: 01631 562244). The Hen House coffee shop at Fanmore by Ulva Ferry offers home baking, drinks, soups and snacks to take away, plus local gifts. Great views across to the islands from outdoor seats. At Ballygown (near Ulla Ferry) Lip na Cloiche Garden and Nursery is a small garden overlooking Loch Tuath and the Isle of Ulva. Plants, herbs and fresh eggs for sale, as well as beachcoming crafts and cards. Open all year. No admission charge (donations welcome). Contact Lucy Mackenzie Panizzon. Tel: 01688 500 257. Ballygown restaurant (3 miles from Ulla Ferry) is open for evening meals. Homemade haggis a speciality. Booking is advisable as there are only 4 tables. Bring your own alcohol. Tel: 01688500113 / 07748046289. 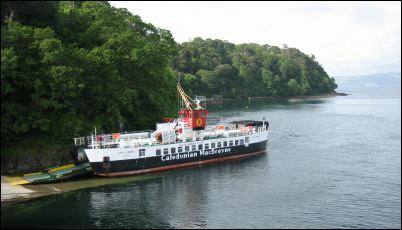 For those arriving from Oban the CalMac ferry at Craignure without transport, bus number 11 will take you to the castle. The Calmac package for Duart Castle enables you to travel by ferry from Oban to Craignure and board the bus. This operates from May to mid October. You can get your travel tickets from the Caledonian Macbrayne ferry office in Oban. For over a hundred years it lay in ruin until it was bought and restored in 1911/12 by Sir Fitzroy MacLean. 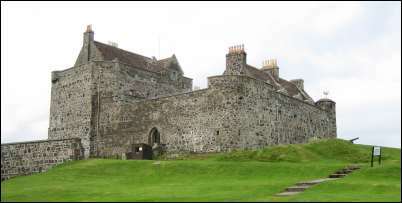 Duart Castle now houses much MacLean memorabilia. You can visit the kitchen, Banqueting Hall, the Sea Room and various bedrooms. Upstairs via spiral staircase is the story of the MacLean chiefs and you can also walk out onto the battlements. Prisoners (models really) from the Spanish Armada are kept in the dungeon. Sitting in twelve acres of ornamental gardens, Torosay Castle is a Victorian mansion built in 1858 by the Scottish architect David Bryce. It was open to the public for many years but then closed and was sold in 2012 to a private buyer. The ferry arrives here from Oban. There is a tourist information centre, inn, filling station, cafe, grocers & post office, as well as a swimming pool and golf course. Cycle hire is available from Kells Gallery & Crafts (tel: 01680 812580). The Craignure Producers' Market is usually held monthly on Sunday afternoons from April to September in Craignure Village Hall. There's also a Christmas market for crafts and local produce. Tel: 01680 812028. The small village of Salen sits at the narrowest point of the island, approximately halfway between Craignure and Tobermory. A minor road cuts across the island from here on the east coast to Gruline on the west coast. It is also convenient for the Fishnish ferry to Lochaline. Facilities in the village include shops, laundrette, filling station and post office. There are 2 hotels and a coffee shop. An Agricultural Show is held here each year in August. Glenforsa airfield is one of the most spectacular grass airstrips in the UK and is available for use by small private planes. The ruins of Aros Castle stand on the north side of Salen Bay. Pennygown Chapel is 2 miles to the south of the village. Although now in ruins, it is still worth a visit as its graveyard has some interesting carved grave slabs. The A849 road from Craignure which heads for the western coast of Mull is a very scenic route with many hills and lochs. It follows the route that pilgrims to Iona used to follow. Drive past Loch Don and you will come to the Old Mill Guest House. Next is Loch Spelve with its mussel farm, otters and hundreds of birds. At Ardura you can take a track down to Lochbuie, home of the MacLaines and site of Moy Castle and a Bronze Age stone circle. Robert Pollock has produced an excellent guide with diagrams covering the stone circle and also a standing stone. Back on the main A849 road you soon enter the valley of Glen More, a 6-mile-diameter crater of an extinct volcano. Robert Pollock describes stone at Ardalanish Bay south of Bunessan. 2 miles from Bunessan, Ardalanish Farm is home to the Isle of Mull Weavers which creates scarves, shawls, wraps, throws and blankets. This organic farm has Highland cattle and Hebridean sheep. Meat is available to buy. Open daily in summer from 10am to 5pm. Open in winter weekdays only from 10am to 5pm. Telephone: 01681700265. From Bunessan you can continue onto Fionnphort if you wish to reach Iona. Otherwise, take the B8035 road leading northwards. On the Ardmeanach Peninsula (west of Ben More) is MacKinnon's Cave, near Balmeanach Farm. It is deeper than Fingal's Cave on Staffa. Inside is a huge stone called Fingal's Table, believed to have been used as an altar. South of this spot is MacCulloch's Tree, which was fossilised 50 million years ago and sits trapped in lava. You will need to be good walkers to reach these places. You can only enter the cave at low tide - so take care to watch the level of the sea. Back on the B8035, just before the turn to Salen, north of Knock, is the Macquarie Mausoleum which contains the remains of the man known as the Father of Australia, who was born on the island of Ulva. If you stay on the A849, heading towards Iona, you will see a turn to Carsaig. The Carsaig Arches are a group of sea-made tunnels on the southern coast. Nearby, the Nuns' Cave has strange carvings, said to be the work of the sisters chased out of Iona at the time of the Reformation. These places are not easy to get to. Access to them is only possible at low tide, so watch out you don't get trapped by the sea. At the end of the A849 road, you reach this village where the ferry takes passengers over to Iona. There are several places to stay overnight, a restaurant, and the ferry office. Fingal Arts & Crafts has a good selection of gifts. Look across to Iona and you will see the Abbey. The Saint Columba Welcome and Exhibition Centre and Iona Abbey Information Point in Fionnphort is open daily 11am - 5pm, April - September. Tel: 01681 706400. Erraid is a tidal island just south of Fionnphort. Visit the Erraid web site. Nine crannogs (ancient loch dwellings) on Mull have been surveyed by Mark Holley. Why not make a day-trip over to this rugged part of the mainland opposite Mull. Take the ferry from Tobermory to Kilchoan or from Fishnish to Lochaline. Ardnamurchan Point is the most westerly place on the mainland. Mull & Iona Taxi is operated by David Greenhalgh who is a founder member of the Argyll Islands Tourist Guides Association. Transport by 8-seater minibus. Private day or half day tours. Airport collections possible from the mainland. Walking tours on Mull and Iona also available. Tel: 01681 700 507 / Mobile: 0788 777 4550. Discover Mull is operated by Arthur and Pam Brown. They offer day tours (7 - 8 hours) in their Landrover (maximum 8 people). Tours can cover wildlife, flora and fauna, local history, folklore and geology. Departures are usually from Tobermory, but other pick-up points can be arranged. Prices: £30 (adults) and £25 (children under 14). Includes home made lunch and coffee. Tel: 01688 400415 / Mobile 07780 600367. Self catering accommodation also available. Mull Magic can offer day walks starting from Tobermory (with collection from Craignure if necessary), or 5-night walking holidays based on the island. Custom guided walks and self guided tours also available. Tel: 01688 301213 / 07923 153976. Richard Atkinson will be your guide on Isle Of Mull Wildlife and Birdwatch Safaris (Island Encounter) based at Salen on Mull (Tel: 01680 300 441). Full day trips with lunch and binoculars provided. 8-seater vehicle. He will fetch you from the ferry if necessary. All year service. They also have a variety of coach & boat trips departing from Oban, and cruises from Fionnphort (Mull). Tel: 01681 700338 / 01631 571112 / 01631 562842. Online booking available. Sea Life Surveys have a choice of 2 different boat trips from Tobermory - whale watching or an 'Ecocruz'. Booking recommended. Tel: 01688 400 223 / fax: 01688 400 383. They established the Hebridean Whale and Dolphin Trust in 1992. St. Hilda Sea Adventures offers 5 to 11 night cruises for up to 6 people onboard St Hilda or 8 people on Seahorse II. Ideal for family holidays. Departing from Dunstaffnage Marina near Oban, there are scheduled cruises around Mull, Iona, Staffa, Treshnish Isles, Islay, Jura, Skye, Small Isles and the Outer Hebrides including an 11-night voyage to St Kilda. Private charters also available. This ex-tall ship, St Hilda, is a 54ft wooden ketch with 2 cabins (1 double and 1 with 4 berths) with a skipper and cook. Seahorse II is a small ship for 8 guests with 2 single cabins, 2 twins and 1 double cabin. 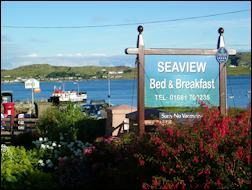 Bed and Breakfast can be available when the vessel is moored in Tobermory Bay. Packed lunch or dinner can be added to the B&B package. Tel: 07745 550 988. Northern Light offers private charter, wildlife cruises, bird-watching and whale-watching cruises, dive charter, island cruising and research and survey services. 2 boats based in Oban. Tel: 01680 814260. New Horizon Sailing - sailing holidays onboard an 'Oyster' yacht around the west coast, including the Inner and Outer Hebrides. Holidays start from Tobermory. Calgary Beach Sailing Club - dinghy hire and tuition (May-October) at Calgary beach. Skills workshops also available. Skippered cruises and day trips for 2 people from Tobermory can be booked onboard Ocean Minx, a 36-ft traditional wooden sailing vessel. Tel: 0777 6130224 / 01688 400 465. Ardnamurchan Charters offers wildlife boat trips from Laga Bay (Ardnamurchan) to Tobermory (Mull) and also trips to view the sea eagle nest at Bloody Bay (Mull). Spaces are limited so please book in advance. Tel: 01972 500208. B&B prices from £37 per person. 3 star Victorian hotel overlooking Tobermory. Spectacular views across the Sound of Mull. Large range of single malt whiskies. satellite TV, hairdryer, trouser press, tea/coffee. and award winning customer service. in an 1870s traditional Hebridean cottage. The nearest quality ensuite accommodation to Iona. of Fionnphort beach from the breakfast room. Famous hearty �Fingal�s Breakfast�. Taste Our Best award. Just a minute's walk to the ferries to Iona and Staffa. Only 200 metres from the bus stop and ferries. Close to the local pub, grocery store, gift shop, post office. Ideal for exploring the islands, the Ross of Mull & surrounding area. Short break packages can include a Wild About Mull wildlife guided trip. Winner of 2010 Scottish Thistle Awards Extra Mile (Small Business). Scottish Tourist Board 4 Star Gold B&B. Green Business Tourism Scheme Gold award. with all home comforts such as free Wi-Fi, hairdryer, satellite TV. Special rates for stays of 3 or more nights. Check web site for special seasonal offers. Online availability calendar and booking facility. and help you make the most of your stay on the island. library of local books & maps, cosy sitting room. Spacious modern bungalow on the Ross of Mull. Family run B&B in an area of outstanding natural beauty. Spectacular views over the sea towards the "Burg". Situated between Bunessan and Fionnphort. Only 3 miles from ferries to Iona and Staffa. Lots of wildlife and birds can often be spotted. Ideal for fishing, golf, cycling, walking, etc. all with hairdryer, tea/coffee making facilities, etc. TV lounge with panoramic views. B&B prices £32 - £45 per person. 3 courses from £25 per person. home grown vegetables, lamb/beef from our farm, locally caught fish. No smoking. Credit cards accepted. Spacious, luxury 36' x 12' Tudor Goodwood static caravan. maximum 2 adults plus 2 children up to 11 years old. in a quiet and secluded corner plot overlooking the moors. and the white beaches of Fionnphort. Close to the village pub, restaurant, post office and shop. Convenient for exploring the islands, the Ross of Mull & surrounding area. Ideal for walkers, wildlife lovers, and outdoor enthusiasts. Freeview satellite TV and DVD player. and additional toilet with wash basin. and a corner dining suite. Central heating. Private off-road parking. Sunny private patio with picnic bench, small garden, and BBQ facilities. Laundry service available. Cycle hire. include heating, electricity, gas, bed linen, and towels. Sorry no dogs. Open Easter - September. Choice of 4-star properties on the Ross of Mull. Each has fenced garden and garden furniture. Satellite TV, CD, washing machine, dishwasher, etc. Arrangements can be made for advance ordering of groceries. Home-produced lamb, beef & eggs available to purchase from the farm. Prices from £300 - £800 per week. Check web site for availability calendar. Traditional granite-built farmhouse. Newly renovated. 3 miles from Fionnphort (Iona ferry). 3 bedrooms: 2 double and 1 family (double bed and single bed). Outstanding views over the surrounding lochs, mountains & moorland. Well-equipped kitchen, separate dining room, sitting room. Traditional stone cottage between Bunessan and Fionnphort. New kitchen & bath/shower room. Sitting room with TV & DVD player. Electric heating and open fire. 1 double & 2 twin. 1 bathroom & 1 shower room. Sitting room, kitchen/dining room and entrance porch with utilities. Newly converted to luxury standard from a traditional stone barn. 1 mile from Fionnphort (Iona ferry). Views over the surrounding hills, moorlands and lochs. 4 bedrooms: 2 double rooms, 1 twin, 1 single. Bathroom, sitting room and kitchen/dining room, separate WC. Detached bungalow built in 2012. 1 mile from Fionnphort, with countryside views. separate shower room. Pets by arrangement. Traditional style cottage built in 2012. 2 ensuite bedrooms (1 kingsize double & 1 twin). dining area with patio doors, utility room, shower room. Cottage on the 4,000-acre Ardura Estate. Open-plan living/dining room with wood-burning stove. Enclosed garden (adjacent to river). Ground floor facilities (two steps to entrance). 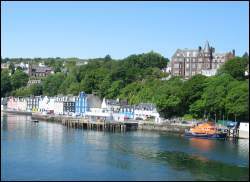 There are lots of places to stay in Tobermory and all over the island of Mull. Arle Lodge (5 miles from Tobermory) offers the comforts of a B&B with the convenience of self catering. 36 beds (twin / family rooms), hot showers, kitchen and a large sitting room which can double as a lecture room for groups. Children over 8 welcome. Suitable for individuals, couples or groups. B&B price includes self service continental breakfast, or you can exclusively hire the whole lodge for self catering. Contact the Morris Family. Tel: 01680 300299. St Hilda, an ex-tall ship, is a 54ft wooden ketch with 2 cabins (1 double and 1 with 4 berths) with a skipper and cook. Bed and Breakfast onboard can be available when the vessel is moored in Tobermory Bay between cruises. Packed lunch or dinner can be added to the B&B package. Tel: 07745 550 988. Achaban House is a 150-year old former manse overlooking Loch Pottie, on the western tip of the Ross of Mull. Less than 1 mile from Fionnphort. 3 Star Guest House with 6 bedrooms (1 family, 2 double, 2 twin, 1 single). Brockville is a 4 star B&B in Tobermory in an elevated location off Raeric Road. 2 spacious bed-sitting rooms with ensuite facilities. Wi-Fi access. Contact Helen Chalmers. Tel: 01688 302741. Craigrowan is a 4 star B&B with 3 ensuite bedrooms at Pennyghael overlooking Loch Scridain. Member of Scotland's Best B&Bs. Contact Reg & Sue Morgan. Tel: 01681 704230. Cuin Lodge offers 3 star B&B with double/twin/family bedrooms. Situated on the side of Loch Chumhainn (Cuin) 1 mile outside the village of Dervaig. Contact Philippa and Graham Dale. Tel: 01688 400346. Druimnacroish is a 3 star guest house with 6 double/twin bedrooms. Situated in 3 acres of gardens, 1.5 miles from Dervaig. 10 miles from Tobermory. Evening meals available by arrangement. Contact Neil & Margriet. Tel: 01688 400274. Killoran House is situated 1.5 miles from Dervaig. 5 ensuite bedrooms (double & twin). Contact Natasha and Craig. Tel: 01688 400362. 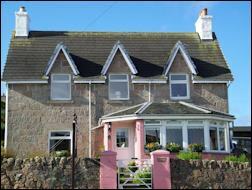 Linnhe View Bed & Breakfast is a former manse at Craignure and has 3 bedrooms (double/twin/single). A very warm welcome awaits you from owners Jim & Mary van Heerden. Tel: 01680 812007. Situated in Dervaig The Bellachroy - the oldest inn on Mull - has 6 ensuite bedrooms. Renowned for good food (including many local seafood specialities), with a friendly pub with regular entertainment. Tel: 01688 400314. The Highland Cottage Hotel offers a 4 star B&B in Tobermory. Recommended by the AA and Johansens. Six luxurious bedrooms at different tariffs (including 2 rooms with a four-poster bed!) and excellent food (2 AA rosette restaurant). Personal service and friendly atmosphere. Contact David and Jo Currie. Tel: 01688 302030. Achaban Cottage is a converted 150-year old stable overlooking Loch Pottie, on the western tip of the Ross of Mull. Less than 1 mile from Fionnphort. 2 bedrooms (double & twin). 3 stars. Ardnacross has 3 separate self-catering properties: Dairy cottage (sleeps 2), Cottage in the old farm square (sleeps 7) and the Farmhouse (sleeps 12). Scottish Tourist Board 3-4 Stars. Located between Salen and Tobermory on the east coast with views across the Sound of Mull. Ardachy House Hotel has a 1-bedroom self catering apartment for 2 - 4 people. 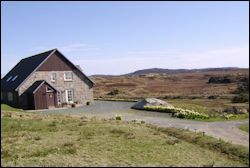 Located on the Ross of Mull, 2 miles from Bunessan and 7 miles from ferry to Iona. Aros Mains is an 18th century Georgian house where a 3-bedroom apartment on the first floor sleeps and overlooks the ruins of Aros Castle. 2 adjacent cottages each sleep 4 - 5. Situated 2 miles north of the village of Salen in centre of Mull. Calgary Cottages - Lime Tree Cottage (2 bedrooms, sleeps 4) and Bramble Cottage (3 bedrooms, sleeps 6) are situated near the Calgary Farmhouse and Carthouse Gallery / Tearoom. The Carthouse Lofts are across the courtyard from the Calgary Farmhouse and situated above the Carthouse Gallery. Choice of two 1-bedroom lofts, each sleeping 2 - 4. Only 300 metres from the white sands of Calgary Beach. The Coach House and Studio Apartment are in a renovated 18th century property at Kilpatrick, close to Duart Castle. The Coach House sleeps 6 in 4 bedrooms. The Studio sleeps 2/3 in 2 bedrooms. The Coach House in the grounds of Ardfenaig House has 2 bedrooms and sleeps 4 - 6. Scottish Tourist Board 4 Stars. 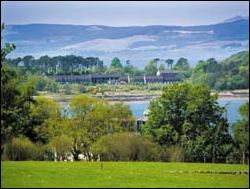 Cill-Mhoire Lodges offer 3-star self catering in 2 lodges (1 sleeping 4, 1 sleeping 6). 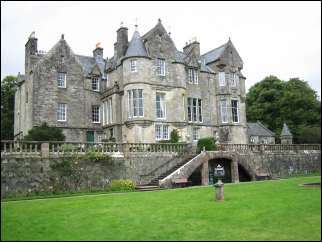 Set in extensive gardens near Dervaig. Corrie Cottage sits on the edge of Fishnish Bay in 40 acres of private ground on the east coast of Mull between Craignure and Tobermory. Sleeps 4 + 2 with 2 bedrooms (1 double, 1 twin). Crannich Holiday Caravans - 3 self catering holiday caravans on a farm in Glen Aros, near loch Frisa and the White Tailed Eagle 'hide'. 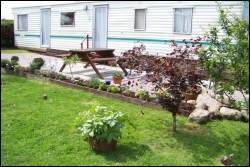 Each caravan sleeps 4 people (2 bedrooms, bathroom, kitchen / dining / living area). Available from April to end September. Druimnacroish has a self catering wing with 1 kingsize double room and 1 bedroom with full-size bunk beds, living/dining room, kitchen, bathroom. Located 1.5 miles from Dervaig. 10 miles from Tobermory. Eastcroft is a traditional crofters cottage with 1 bedroom which has 1 double bed & 2 single beds. Situated at Lochdon, about 3 miles from the ferry terminal at Craignure. 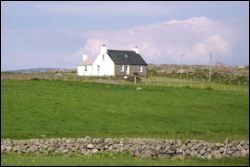 Glenaros Holiday Cottages: 5 self catering holiday cottages on a working estate farm. Each cottage is individual in style, with open fires, cosy bedrooms, well equipped kitchens and have spectacular views. They are open all year and have STB 2 star grading. Glenfuran Cottage offers self catering accommodation for 5 + 1 in 3 bedrooms. Located on the outskirts of Tobermory. Scottish Tourist Board 4 Stars. Otter Holt in the village of Salen is a self-contained holiday apartment, sleeping 2 (+2). Sanna Cottage in Tobermory is a cedar chalet for up to 6 people (1 double bedroom, 1 twin bedroom, 2 sofa beds in the lounge). Views over Tobermory Bay and the Morvern peninsula. Short breaks also available at times. 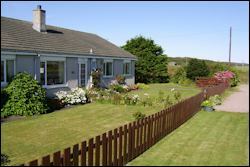 Seaview Cottage on the outskirts of Salen sleeps 5 - 7 in 2 bedrooms. Temple Cottage is a cosy 1-bedroom cottage set in its own private garden in the conservation village of Dervaig on Mull. Free Wi-Fi. 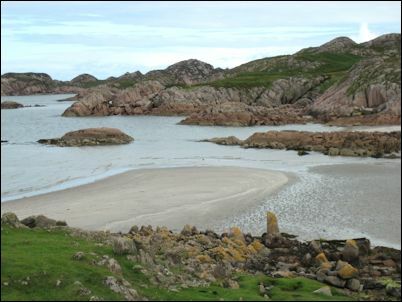 The Bothy is a self catering static caravan in Fionnphort (Iona ferry & boat trips). Ideal for couples and families (up to 4 people). Cycle hire is also available. 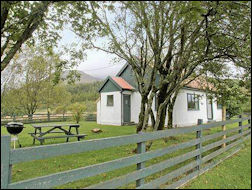 Dervaig Bunkrooms is a self-contained unit sleeping 6 people in 2 rooms (one sleeping 4, one sleeping 2). Contact Lucy - 07435656420. 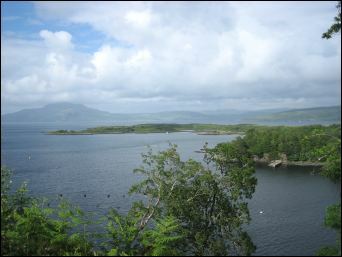 Dervaig is 7 miles north of Tobermory. The Puffer Aground - choice of two 1-bedroom self catering cottages in Aros near Salen. The Smithy is a large house with 4 bedrooms sleeping up to 8 people. 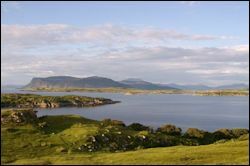 Located on the west coast of Mull overlooking Loch Tuath, Ulva and Gometra. 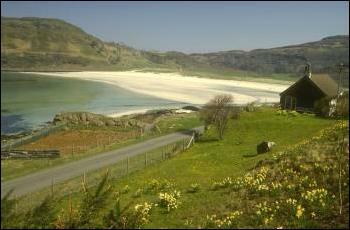 Traigh Mhor is a traditional crofter�s cottage near Bunessan in the south of Mull. 6 miles from the ferry to Iona. 3 bedrooms, sleeps 6. 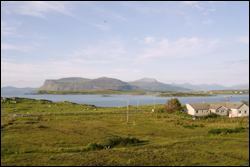 Treshnish Farm (near Calgary) has a variety of self catering properties including cottages, a studio and blackhouses. Tobermory Youth Hostel (Main Street) has 4-bed and 6-bed dorms as well as private rooms for 2 or 3 people. Online booking. Member of SYHA. Telephone: 01688 302481. Dervaig Village Hall Hostel (3 stars) has 10 beds for individual or group bookings. Open all year. Close to village pub and shop. Tel: 01688 400491 / 07919870664. Craignure - Shieling Holidays - from the Craignure ferry turn left on the A849 (towards Iona). After 400 metres turn left opposite the church, the site is just past the old pier. Views across the Sound of Mull and Loch Linnhe. Family run campsite with free hot showers and dishwashing facilities. Pitches for caravans, campers, trailer tents and tents. Also glamping in the Shielings (unique tiled and carpeted cottage tents). Free WiFi. Laundrette. Calor gas. Chemical disposal, motorhome/campervan waste disposal point. Common Room with multi-fuel stove, TV, kettle and microwave. Designated campfire and barbecue area. Games room with small pool table and full size ping-pong table. Dogs welcome. Tel: 01680 812496. Tobermory Campsite is 1.5 miles outside Tobermory (about 20 minutes' walk). Tent pitches. Hard-standing and grass pitches for caravans, camper vans, etc. Static caravans and shepherd's huts (glamping). Free Wifi. Toilets/showers. Dishwashing sink. Contact Angus and Catriona Williams. Tel: 01688 302615. Fionnphort - Fidden Farm - map ref. 303215 on Landranger 48 (on entering Fionnphort turn left past the car park, follow the road for 1.25 miles). Uisken - follow the road to Uisken from Bunessan for 3 miles. Loch Scridain - map. ref. 513295 on Landranger 48. Loch Beg - map ref. 532292 on Landranger 48. Loch Na Keal - map ref. 537412 on Landranger 48 (on flat grassy area between the road and river). Loch Tuath - map ref. 445424 on Landranger 48 (Eas Fors Waterfalls). Calgary Bay - map ref. 374509 on Landranger 48 (Next to the river just down from the public toilets). Caravans and Campervans are not permitted on the campsite at Calgary Bay. In Tobermory you can get meals in numerous hotels. The Mishnish (food and live music) is particularly well known on the harbour front. There are 2 Chinese restaurants and an Indian restaurant in the centre of Tobermory. The fish and chip van on the pier has a very good reputation. Also on the main street is The Gallery where you can eat in or out, and the Tobermory Chocolate shop & cafe. Look out for Posh Nosh Cafe too. At Fionnphort, the Ninth Wave Restaurant is open for evening meals and is highly recommended especially for seafood and island game. Tel: 01681 700757. If you are sightseeing and driving around the islands, then a very useful tool is the Official Tourist Map to Iona & Mull which pinpoints all the places to see on the islands or alternatively get the Oban and Mull Tourist Map. Lovely colour guide with over 100 pages of photos. Written by P.A. MacNab, it covers the local heritage and culture of the islands, wildlife and the landscape, history of habitation, the clearances, place names, places to visit, etc. Even if you don't get chance to buy it before you go, you will certainly want a copy for a souvenir when you have visited! Available to buy online via Amazon.co.uk. Very nice addition to my bookshelf. Super photo book by Allan Wright of his travels from Oban to Craignure and then clockwise round Mull. Introduction by Bill Clegg (curator of the Mull Museum). Paperback. 120 pages. Published in April 2006. Another of those beautiful books which is far more than a mere guide book, but something to really treasure. Full of colour photos and information about Mull, it also covers the little islands around the coastline (Staffa, Ulva, the Treshnish Isles, etc.) and Iona. Dimensions: approx. 12 x 8 inches. Written by Alastair de Watteville who moved to the island in 1972. Written by Peter MacNab, this is one of the detailed b/w Luath Press guide books with maps. Excellent for discovering some off the beaten track places and historic sites not always mentioned in general Scottish guides. Includes info on where to find standing stones and wildlife. Also contains details of the main tourist attractions. Recommended if you really want to explore the island and understand its history. Paperback. 128 pages. Published in June 2000. An invaluable book if your ancestors came from Mull. This is the story of the people of Mull, as told through the stories of the landlords, tacksmen, cottars, ministers and others who actually lived on or visited the island. The story of those who became rich and those who were bankrupted. The story of the Campbells replacing the Macleans. The story of civil war, Jacobite rebellion and then harsh repression. The economic boom through the cattle trade and kelp, and then economic crisis when these industries collapsed. From medieval society to tourism in the 20th century. Author: Jo Currie. Paperback published in 2001. 400 pages. Includes sections of old b/w photos, colour photos and portraits. Another useful colour guide book especially for walking in this area. By Brian Conduit and John Brooks. Request a free brochure from the official tourist board.